A steely, indomitable will is on view in this new austere, canny adventure drama from Brazil native Joe Penna, known for his more flashy YouTube work. An efficient, if unoriginal Arctic (in Danish and English with English subtitles) features Mads Mikkelsen (whose background includes ballet and dance) and includes Maria Thelma Smaradottir making the most of gelid conditions on a nineteen day Icelandic shoot. 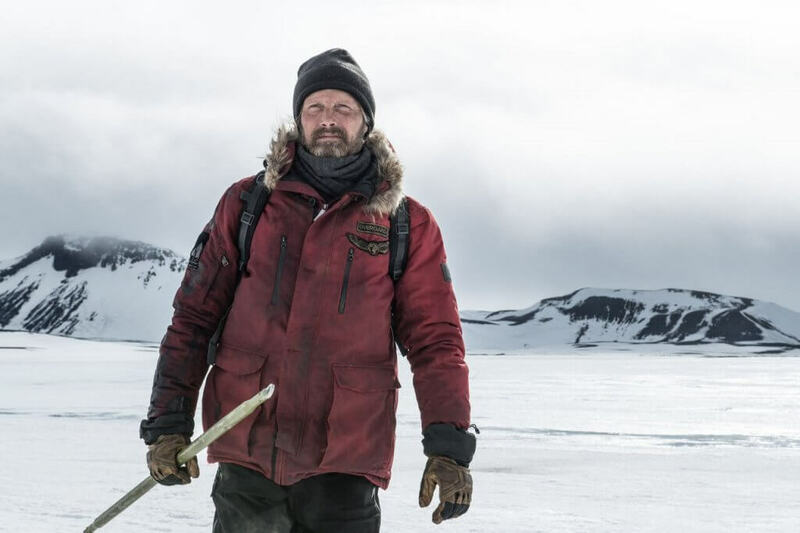 A downed plane in a vast northern frozen tundra has Mikkelsen’s pilot (known as Overgard from his outerwear) making conditions bearable through a means of collecting trout amid a gusty wind. A watch and another device also helps get him through the day and night (sans darkness) as the early section divulges an SOS in the barren landscape. Those living through recent polar vortex shifts may have an inkling of some of the incessant conditions in his makeshift camp where travails elicit growls. The screenplay (co-written by Penna) in its unhurried nature has a shift when a helicopter Overgard’s trying to signal has a calamitous landing yielding a critically wounded new partner in Smaradottir (a pilot’s wife) who will utter a single word. Here, a minimalist approach plays out in heartfelt, wrenching ingenuity that may have some voice out on a particular decision. The logistics from Penna and his crew are handled well enough so Mikkelsen (The Hunt, Casino Royale) internalizes a meaningful intimacy and immediacy from a flinty, weathered visage — whether enduring frostbite or digging into ramen. And, moments with a scary polar bear (imagery finely superimposed into the action) add to the perilous rasping, like ice on metal. Torment from the oblivion and isolation is felt in a raw and visceral way allowing a spare Arctic to elegantly bear its elemental, survivalist qualities as the meager and mundane fall prey to risk. Even if the drama may not be conveyed with the power of similarly-themed fare like All is Lost or The Revenant the invigorating and exhausting are quite palpable in the cruelest of conditions where a howl of humanity remains in the crackerjack presence of a middle-aged Danish thespian. MPAA Rating: Rated PG-13 for language and some bloody images.